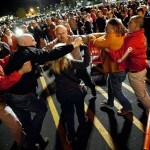 Black Friday – After watching media clips of ‘Black Friday’ shoppers, I was reminded of what an American soldier once told me; “We’re an army at war, while the rest of the nation is at the mall.” Quite an astute observation, wouldn’t you say? Does dividing Israel means Devastation for US? 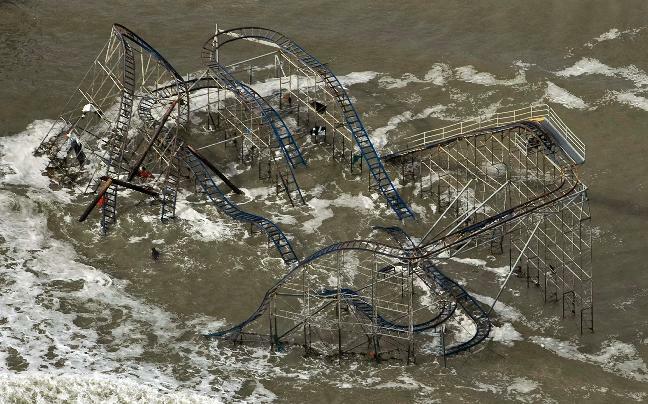 – A roller coaster, driven into the Atlantic Ocean during Hurricane Sandy may end up staying there as a tourist attraction. Did you know that when American presidents call for Israel to divide their land, bad things usually follow? October 28 – November 4, 1991 – While at the Madrid Conference, President George H.W. Bush calls for a ‘two-state plan’ resulting in “The Perfect Storm.” The storm (Hurricane Grace and two other systems) damaged Bush’s home in Kennebunkport, Maine, leaving 13 dead and over 200 million in damage. August 29, 2005 – Hurricane Katrina, the most devastating storm in our history, strikes as Israeli’s were forced to leave Gaza. All part of the ‘two-state plan’ President George W. Bush proposed for Israel and Palestine. 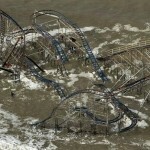 What would you call it; Mother Nature, Climate Change, Coincidence or Divine Intervention? This whole thing stinks and can probably be traced back to Benghazi. What else was damaged or lost in the confusion? One blogger, speaking of Susan Rice’s involvement in Benghazi sees it this way: “She (Susan Rice) is not a bystander. She conspired with Obama & Clinton to defraud the American people. Four Americans DIED in Bengazi. It was a huge foreign policy screw up. They are lying, conspiring to deflect blame onto the producer of some obscure video and hoping like hell that this will go away. If they could bounce Nixon for Watergate … someone should pay double that price for Bengazi. Nobody died with Watergate. There were people in our embassy who could have been saved, but they were sacrificed for the sake of political expediency. I say it’s on Obama. He’s quick to claim credit, when something goes right. If the buck stops with him on good days … then it stops with him on bad days, too. Note the words ‘deflect blame’ used by the blogger. Interesting too, that we’re reading of all these changes in command immediately following Benghazi. Methinks the administration is deliberately trying to shift our attention away from Libya and on to the military. Remember, we may be witnessing a transformation that could cost us big time in the long run. The ‘Red Chinese’ just announced that they landed a plane on one of their new carriers. They’re building up their navy, while the administration here is throwing out seasoned commanders left and right. Don’t forget what happened to a man by the name of Billy Dale, his life and reputation were destroyed by the Clinton’s. Don’t you get weary of these people insulting your intelligence? (2) Fire at State Department leaves three maintenance workers injured by Joseph Serna, L.A. Times, 11-24-12. This entry was posted on Sunday, November 25th, 2012 at 7:18 am	and is filed under Political. You can follow any responses to this entry through the RSS 2.0 feed. You can leave a response, or trackback from your own site. Me thinks you are so right!!! “Mother Nature”? How about FATHER GOD. Me too Susan! And I’m with you Deb, that whole “Mother Nature” thing is an afront to our FATHER God. I couldn’t even stand those wacky old “Mother Nature” margarine commercials! And Steve, I’m just plain wearied of these people, PERIOD! I wish it were only our “intelligence” they are insulting! So are we, like the Israelites when carted off to Babylon, supposed to accept our fate as a discipline from the LORD and live peaceably under these overlords? Guess we SHOULD pray for the poor lost souls in this administration… ’cause vengeance IS coming! I truly fear revolution when this house of cards crumbles, like we’ve seen in so many countries. That is if our enemies don’t serve up something far worse first. Right on, ladies! I threw in ‘Mother Nature’ because our society uses it. Of course, we know from scripture Who controls weather, don’t we (Mark 6:45-52)?